The Divide crosses into the United States in northwestern Montana, at the boundary between Waterton Lakes National Park and Glacier National Park. In Canada, it forms the western boundary of Waterton Lakes National Park, and in the US bisects Glacier National Park. Further south, the Divide forms the backbone of the Rocky Mountain Front (Front Range) in the Bob Marshall Wilderness, heads south towards Helena and Butte, then west past the namesake community of Divide, Montana, through the Anaconda-Pintler Wilderness to the Bitterroot Range, where it forms the eastern third of the state boundary between Idaho and Montana. 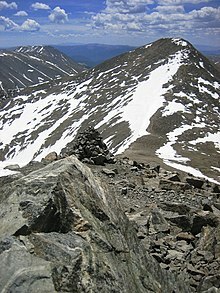 The Divide crosses into Wyoming within Yellowstone National Park and continues southeast into Colorado where it reaches its highest point in North America at the summit of Grays Peak at 4,352 m (14,278 feet). It crosses US Hwy 160 in southwestern Colorado at Wolf Creek Pass, where a line symbolizes the division. The Divide then proceeds south into western New Mexico, passing along the western boundary of the endorheic Plains of San Agustin. Although the Divide represents the height of land between watersheds, it does not always follow the highest ranges/peaks within each state or province. The Divide continues into South America, where it follows the peaks of the Andes Mountains, traversing western Colombia, central Ecuador, western and southwestern Peru, and eastern Chile (essentially conforming to the Chile-Bolivia and Chile-Argentina boundaries), southward to the southern end of Patagonia and Tierra del Fuego. In North America, another, mainly non-mountainous divide, the Laurentian Divide (or Northern Divide), further separates the Hudson Bay-Arctic Ocean drainage region from the Atlantic watershed region. Secondary divides separate the watersheds that flow into the Great Lakes and Saint Lawrence River (ultimately into the Atlantic) from watersheds that flow to the Atlantic via the Missouri-Mississippi complex. Another secondary divide follows the Appalachian chain, which separates those streams and rivers that flow directly into the Atlantic Ocean from those that exit via the Mississippi River. Triple Divide Peak in Glacier National Park, Montana, is the point where two of the principal continental divides in North America converge, the primary Continental Divide and the Northern or Laurentian Divide. From this point, waters flow to the Pacific Ocean, the Atlantic Ocean via the Gulf of Mexico, and the Arctic Ocean via Hudson Bay. Most geographers, geologists, meteorologists, and oceanographers consider this point the hydrological apex of North America, as Hudson Bay is generally considered part of the Arctic. For example, the International Hydrographic Organization (in its current unapproved working edition only of Limits of Oceans and Seas) defines the Hudson Bay, with its outlet extending from 62.5 to 66.5 degrees north (just a few miles south of the Arctic Circle) as being part of the Arctic Ocean, specifically "Arctic Ocean Subdivision 9.11." This hydrological apex of North America status of Triple Divide Peak is the main reason behind the designation of Waterton-Glacier International Peace Park as the "Crown of the Continent" of North America. The summit of the peak is the world's only oceanic triple divide point. Discounting Antarctica and its ice sheets, only one other continent (Asia) borders three oceans, but the inward-draining Endorheic basin area of Central Asia from western China to the Aral and Caspian Seas is so vast that any Arctic and Indian Ocean tributaries are never within proximity of each other. Thus, North America's status of having a single location draining into three oceans is unique in the world. Sources differ, however, on whether Hudson Bay, entirely south of the Arctic Circle, is part of the Atlantic or Arctic Ocean. Hudson Bay's water budget connects to the Atlantic more than to the Arctic Ocean. The channels to the north of Hudson Bay are largely cut off by Baffin Island from the Arctic, so much of the water that enters it mixes with the Atlantic to the east via Hudson Strait rather than north into the Arctic. The result is that most of the ice flowing down the Saskatchewan Glacier eventually ends up as water in the Atlantic Ocean. That ice flows down the Athabasca Glacier to the Arctic Ocean via the Athabasca and Mackenzie Rivers. Ice flowing west goes to the Pacific Ocean via Bryce Creek and the Bush and Columbia Rivers. Ice flowing down the Saskatchewan Glacier goes via the North Saskatchewan, Saskatchewan, and Nelson Rivers into Hudson Bay. While Triple Divide Peak (or, alternatively, Snow Dome) is the world's only oceanic triple divide, there are secondary triple divide points wherever any two continental divides meet. North America could be considered to have five major drainage systems: into the Pacific, Atlantic and Arctic Oceans, plus Hudson Bay and the Gulf of Mexico. Other sources such as the International Hydrographic Organization add a sixth: Canada's Northwest Passage basin. Using just the five, there are four secondary continental divides and three secondary triple points, the two mentioned previously and a third near Hibbing, Minnesota, where the Northern Divide intersects the Saint Lawrence Seaway divide. Since there is no true consensus on what a continental divide is, there is no real agreement on where the secondary triple points are located. However, the main Continental Divide described in this article is a far more distinctive geological feature than the others and its two main triple points are much more prominent. The Continental Divide Trail (CDT) follows the Divide through the U.S. from the Mexico–US border to the Canada–US border. The trail itself is a corridor of pathways - i.e. dedicated footpaths or back roads, either on or near the Continental Divide. A less-developed Canadian extension called the Great Divide Trail continues through five national parks and six provincial parks, ending at Kakwa Lake in east-central British Columbia. ^ It was named by Sir George Simpson, governor of the Hudson's Bay Company, while touring his vast Canadian fur-trading empire in 1825. According to historical sources, "The small circular basin of water at the summit, twenty yards in diameter, is dignified with the name of the 'Committee's Punch Bowl' in honour of which the Governor treated them (his fur traders) to a bottle of wine as they had 'neither time nor convenience to make a bowl of punch, although a glass of it would have been acceptable.'" The reference is to the governing committee of the Hudson's Bay Company in London, England. This page was last edited on 8 April 2019, at 22:24 (UTC).